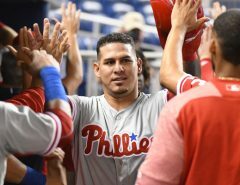 This season, Adams is slashing .318/.422/.747 with 10 homers and 23 RBI in 90 plate appearances while not receiving consistent playing time at any position. 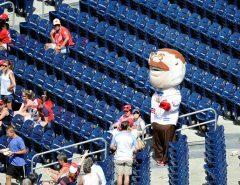 Meanwhile, Ryan Zimmerman has played most of the season (missed a few games in early May with a sore side), hitting .194/.256/.398 in 117 plate appearances. 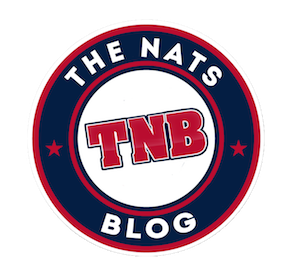 The gap is significant enough that there is plenty of reason to go with Adams every day considering the Nats do not have the luxury of a weak NL East as they have in years past. Beyond just offensive differences, there is a noticeable difference in defense as well. Matt Adams has been a consistently respectable 1st baseman, posting a positive UZR (Ultimate Zone Rating) three of the last four years and currently has a fine 0.8 UZR on the year. Compare that to Zimmerman, who has a 0.0 UZR this year at first but is coming off of a dreadful -4.9 rating in 2017 – 4th worst in the Majors last year. Zim is a defensive liability in terms of making routine throws to create game changing moments like double plays and plays at the plate. So why is there any hesitation? You may have heard this before, but Matt Adams is bad against lefties. REALLY bad. A career .207 hitter against lefties (.287 against righties), Adams is generally considered unplayable against lefties which has limited him to a bench role. 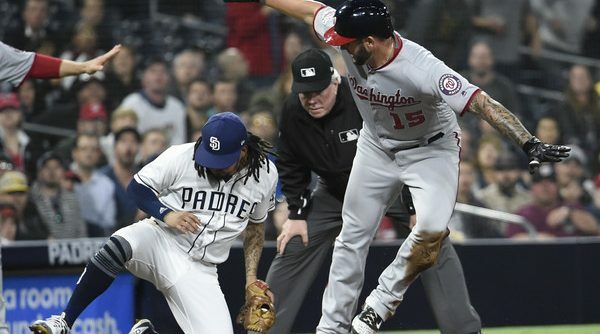 Still, Monday’s game where he hit a moonshot against lefty Matt Strahm brought that idea into question: can Matt Adams hit lefties on a regular basis? Davey Martinez wants to find out, as evidenced by his saying Adams will start against the Padres’ lefty starters this week. Fortunately, that problem may not even matter. Even in all his struggles this year, Ryan Zimmerman has hit lefties well this year as he does every year – a .290 average in 2018, a .306 average career. This really lends to the optimal, and potentially likely, outcome if both players continue playing at their current levels: a platoon. 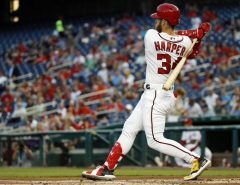 The Nats would maximize both of their offensive abilities, could continue to use Adams in the outfield if they want to give Zimmerman slightly more at-bats, and have a more dangerous bench with a de facto starter available to pinch hit every night. While this may not be the best way to get Zim back into his 2017 groove, Washington simply doesn’t have time to let him figure it out for posterity’s sake. Unless something changes with each player’s splits, a time share at first base is the best way to manage the position in 2018.